DOHA (Reuters) – The Syrian National Council, the main opposition body outside the country in the uprising against President Bashar al-Assad, elected veteran activist George Sabra as its head on Friday. Sabra, a Christian, takes over a body that has come under heavy criticism from international allies for being ineffective in the fight against the Syrian government and for being riven by personal disputes. Sabra immediately appealed for arms to fight Assad’s forces. “We need only one thing to support our right to survive and to protect ourselves: we need weapons, we need weapons,” he told reporters after his election by the SNC’s executive council which has met this week in Qatar. Weapons bring war, which inevitably brings death and destruction. Children are always victims. 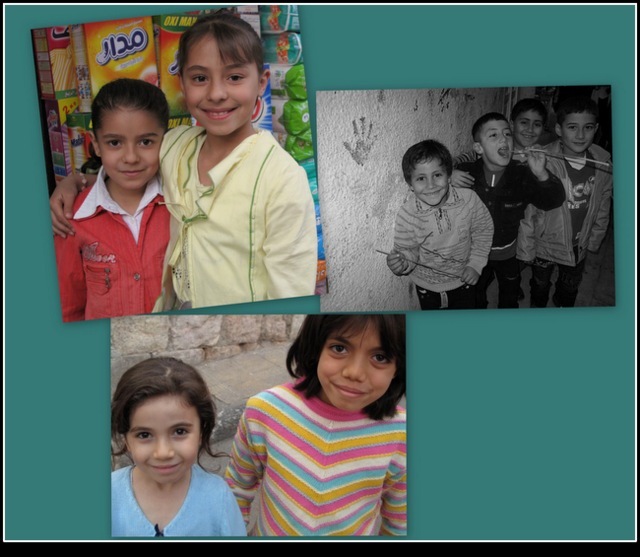 Rarely are we presented in the mainstream media images of the children of Syria as they were before the crisis. The images below come from very recent times, when Syrian children were able to roam local streets freely. George Sabra has apparently applied for a visa to Australia. If he ever visits Australia to lobby politicians, the following questions could be asked. Their focus is on how to best determine Peace and Reconciliation in Syria. 1. Reports indicate that 75% of the Syrian National Council, which you head, are affiliated with or support the Muslim Brotherhood. What is the agenda of the Muslim Brotherhood and who are their spiritual leaders? 2. Why do you ally yourself with supporters of the Muslim Brotherhood rather than internal opposition groups which include many Christians and which have condemned the militarization of the opposition? 3. Reports indicate that a significant number of groups fighting on the ground support an Islamic state in Syria. In what ways would the dismantling of the secular state by Islamist fighters benefit two million Christian Syrians and the millions of other secular Syrians? 4. A religious leader of the rebels is Sheik Yousuf Qaradawi, who is an Egyptian cleric with a Muslim Brotherhood background. He lives in Qatar. Sheik Qaradawi issued a fatwa against the Syrian government in March 2011. Sheik al-Katib, the leader of the coalition of forces that France and Britain recognize as the legitimate representative of the Syrian people is said to be allied with Sheik Qaradawi. Last year, on Al-Jazeera, Sheik Qaradawi declared to his followers, “it is ok to kill one third of Syrians if it leads to the toppling of the ‘heretical’ Syrian regime”. To kill more than 7 million people (Christians, Alawis, other minorities and secular Sunnis) would amount to genocide comparable to that across Europe during the Second World War. Have you condemned Qaradawi’s support for genocide and brought the attention of world leaders to it? 5. You are constantly referenced in the media as George Sabra the “Syrian Christian” but politically you devoted most of your adult life to Communist politics. Communism is a belief you held so strongly you endured imprisonment for it. Are you a practising Christian now, and if so what Christian teachings guide you in your political career? 6. The rebel fighters in Syria have attacked many Christian communities. One of the chants heard at demonstrations since the beginning of the protests has been, “Send Christians to Beirut. Send Alawis to their graves.” 80,000 or so Christians were forced to flee their homes in Homs by rebels. As a leader of the Syrian National Council, what responsibility do you take for the persecution of Christians? 7. Sari Saoud was a young Christian boy killed in Homs last year. He was shot in the street. Apparently, those responsible for his killing filmed his mother grieving over his body and then sent the footage to Al-Jazeera. Al-Jazeera reported that soldiers killed Sari, yet his mother denies that there were any soldiers in the area at the time. It appears Sari was killed to instill terror in the Christian community of Homs and to create propaganda against the government. Have you condemned the killing of Sari and other children by rebels? And what efforts have you made to ensure fair and objective reporting of the Syrian crisis? 8. The rule of law is a democratic belief in Australia. Another democratic belief that Australian citizens must abide by is living peacefully. Can you explain how the democratic beliefs of the disparate rebel groups are superior to the democratic beliefs of the secular Syrian state as they are laid out in the constitution adopted earlier this year? 9. Many Australians have been affected by terrorist attacks in New York, Bali and London. Scores of civilians in Syria have been killed in similar terrorist attacks to those in London and Bali. What are the similarities and differences in regard to the people who inspire and perpetrate these attacks? Who is condemning the bombings in Syria and who is committed to ensuring the Iraqi scenario is not repeated in Syria? 10. The new opposition coalition group you work with refuses to negotiate with the Syrian government. Thousands of regular Syrian army soldiers have been killed. Tens of thousands of children have lost their father and the fathers of tens of thousands of other children will be maimed and disabled for life. What can justify an unwillingness to come to the negotiating table and work for peace immediately? When do you think is the appropriate time to do the challenging and necessary work for peace and reconciliation?